Thursday, just after noon, her nest is empty. I figured she’d stepped out to take care of . . . well, you know. Expectant mother and all that. But, while I was watching, Dad flew in, probably ready to share lunch. Between the way he quizzically turned his head from side to side and the flitting that went on as he hopped from one branch to another, I felt I could read his mind: where in tarnation is she? I turned away for less than a minute and she’s back and the he (I’m guessing, but what else?) is off again. 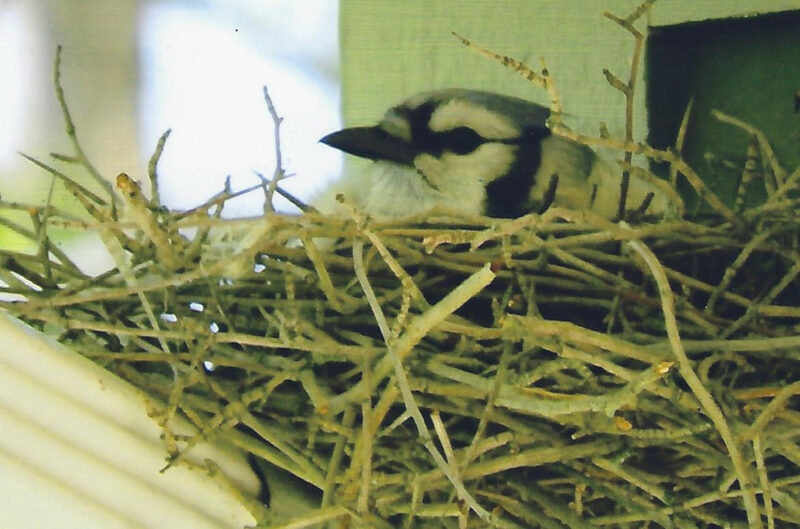 My first note was May 21st: jay still on her nest. Making today the 18th day of her nesting. According to Stokes, the time is now. But, also according to Stokes, there may be a “practice” time before laying and incubation really get started. When the time is up, she’s supposed to stay on her nest and accept her food in bed. But we have a baby! This morning I had my camera ready and “caught” Dad flying in. He did offer Mom a morsel but they — to my complete astonishment — both directed their attention to a tiny beak poking up from the bottom of the nest. So it wasn’t a practice pregnancy after all! Moments later (well, I can’t spend all my time at the window) she’s gone again. June 9. Mother Jay sits as unconcernedly as ever. Wouldn’t it feel different to have life rather than the hard shell of eggs beneath? I wonder what she thinks about during those long days on the nest. Birds do think, don’t they? Does she watch me with any interest as I dress in the morning, brush my teeth, take my vitamins and put on a bit of lipstick? Does she pay any attention when I exercise before going to bed? It’s dark then and my light is on with not much else to look at. Does she find me as interesting as I find her? Does she think? Of course. Monday, June 11 — The nest is empty. Earlier she flew in but immediately settled onto the nest. Is the little one not yet ready for breakfast? Watching more I see one tiny head pop up and then disappear. Dad swoops in but finds his rapacious mate gone and leaves. Patience (mine) pays off for Mom does eventually return to feed THREE little ones. Tuesday — Watching the jay reminds me of my own pregnancies. (And boy! was that a long time ago!) I think most women get increasingly antsy as the pregnancy progresses: I want that baby out — NOW! Only that’s when the work really begins. She was better off carrying the load. Jays of course have none of that to contend with but I’d bet she was happier sitting on a bunch of eggs and being catered to rather than the little birdlets now beneath. Wednesday — it’s becoming more of an effort for her to tamp the kids down when she’s ready to settle.